I'm a super snacky person. My 3 square meals are important to me, yes. But my snacks?! I can. not. skip. I guess it's because I feel like snacks are when you get all the good stuff in, you know? At meal times, you have to be sure that half of your plate is fruits or vegetables, one quarter is protein, and one quarter is some sort of good-for-you carb. I get all tangled up in my head over making sure my plate is balanced just so. But at snack time, I cut footloose and fancy free. Chips and dip? Put 'em right here. Chex Mix? Come to mama! And possibly the greatest snack of all time? Popcorn, of course. Of course. Who doesn't love snacking on popcorn?? The only thing I don't like about popcorn is that I have to grab an entire handful to fill my mouth... it gets messy. Think cookie monster. But with popcorn 😬. In an effort to make my popcorn-eating a little more ladylike, I made popcorn bars. This way I can pick up an entire handful of popcorn with just my thumb and my index finger, pinky up. But eating popcorn in bar-form is completely brilliant. Not only do you get more popcorn in every bite, but let's talk about the gooey marshmallow filling for a moment, shall we?? 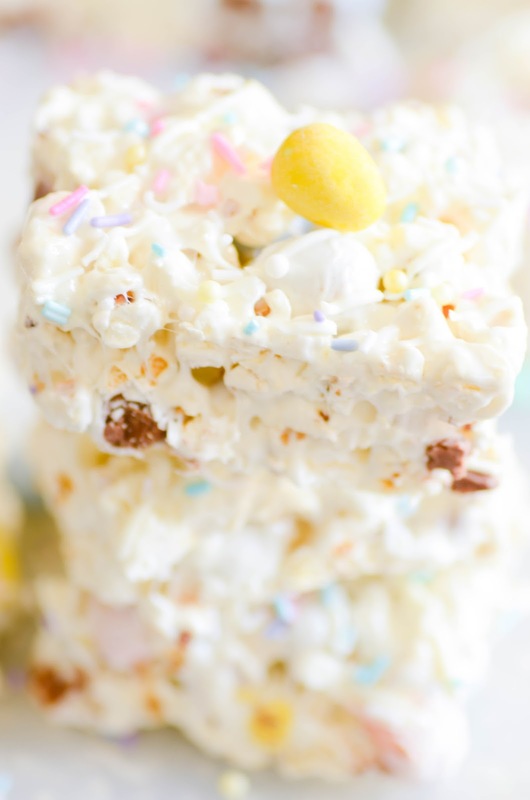 It's a Rice Krispie Treat, but with popcorn. Same concept. Same basic recipe. But so much better. Especially because it's not just plain old popcorn we're using here-- we're talking KETTLE CORN. Pretty much any time I'm working on a popcorn recipe, it's going to have a kettle corn base. I love using store bought kettle corn because the crunchy sugar coating is perfect for protecting the popcorn's texture. It keeps the popcorn underneath from getting soggy, which sometimes happens when we mix it with melted chocolate or butter or caramel. Using kettle corn completely solves that problem. 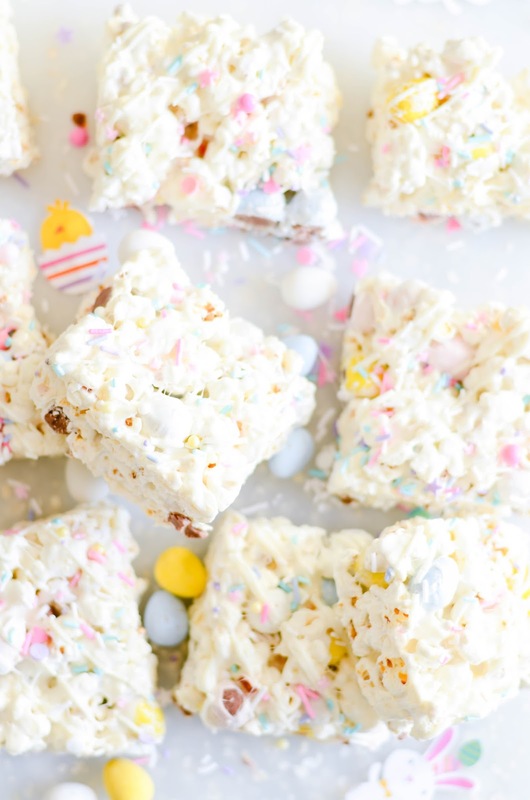 Enjoy this quick and easy recipe as an after school snack or cute Easter treat! 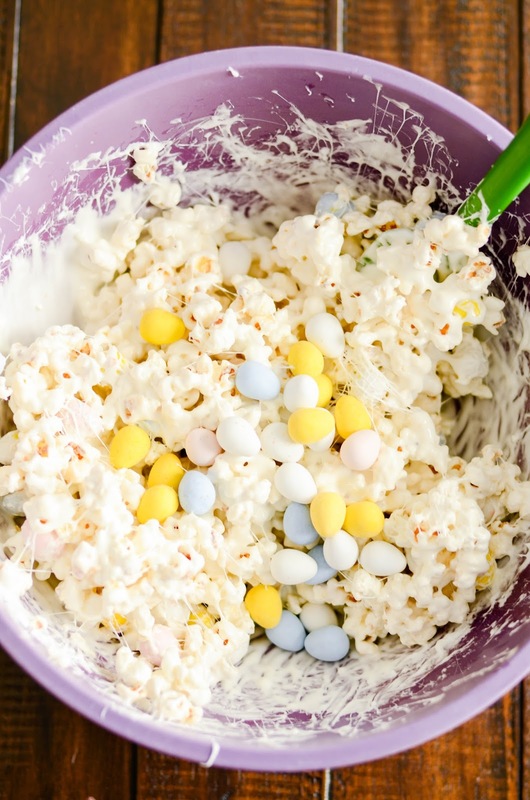 I used mini Cadbury eggs, but you could switch things up with M&Ms, Reese's Pieces, or any of your favorite candies. Line a 9x13 baking dish with parchment paper or foil (if using foil, spray lightly with cooking spray). Set aside. 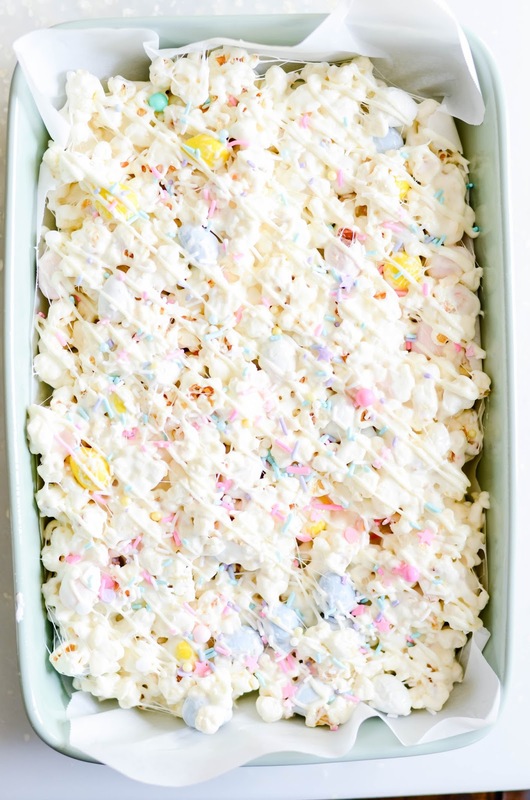 In a large microwave safe bowl, heat the marshmallows and butter in the microwave for 90 seconds. Stir until marshmallows are melted and smooth. Add the popcorn. Use a large spatula to mix until all the cereal is coated in the marshmallow mixture. Gently fold in the Cadbury eggs. Press the popcorn mixture into the lined baking dish gently until level. Let cool for at least 30 minutes (quick set in the refrigerator or freezer). Once the marshmallow has cooled and set, cut the bars into 9 squares. If desired, drizzle the white chocolate over the bars before cutting and serving.